From 211lbs to 185lbs in 7 weeks. Lol, and in my log I wanted to get there by september 10th.... murdered that goal. You got a tan to complement the weight loss? from pale and fat to ripped & bronze!!!! nah, my weight loss phase started my first day of vacation. what's funny is that i had a 38" rvj in that fat/pale pic. I should be hitting 40" after some jumping practice next week, hopefully! My squat dropped more than I would prefer..
Edited the topic title... july 1st I was 210lbs. I got down to 185lbs on August 9th. This picture was from today (~184lbs). July 1st to August 9th is 40 days. JUST under 6 weeks. Sick man, pretty impressive drop. How much did your squat (absolute and relative) decrease in that time? Hope you get that 40 man, would be great! From 415lbs to about 375lbs now. I'm sure my relative went up by like 0.05 but I wanted more than that. However, I'm looking to bounce back really hard and pack on muscle and strength when I get back. 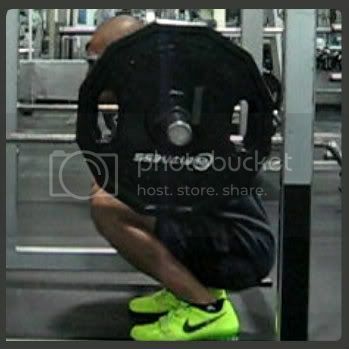 My squat should be back up to 415 at around 195 or 200 pounds instead of 210 pounds. I would be interested in your VJ performance with decreased bw and same relative strength. I would expect your SVJ to be the same, not sure about RVJ though. Might be that because of its reactive nature (vs. nearly purely power output) your RVJ will actually profit from the decreased bw alone, maybe not though. Would be interesting to know, you should test that for us to learn . good job trying to look like a zyzz.. I'm going to assume my RVJ and possibly SVJ will be a bit higher because focused on depth jumps also. Haven't done that in years.